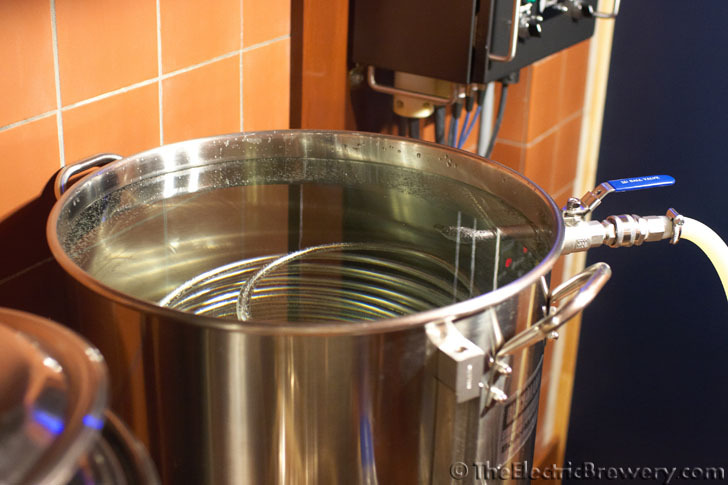 You'll need to use about twice as much water to start as the finished beer you wish to produce. Since we want to produce 10 gallons of beer we fill the Hot Liquor Tank with 20 gallons of water. Before disconnecting or connecting any hoses, it's a good practice to always CLOSE all of the ball valves in the entire setup. Do this now. When closed, the handle will be perpendicular to the flow of liquid through the valve. 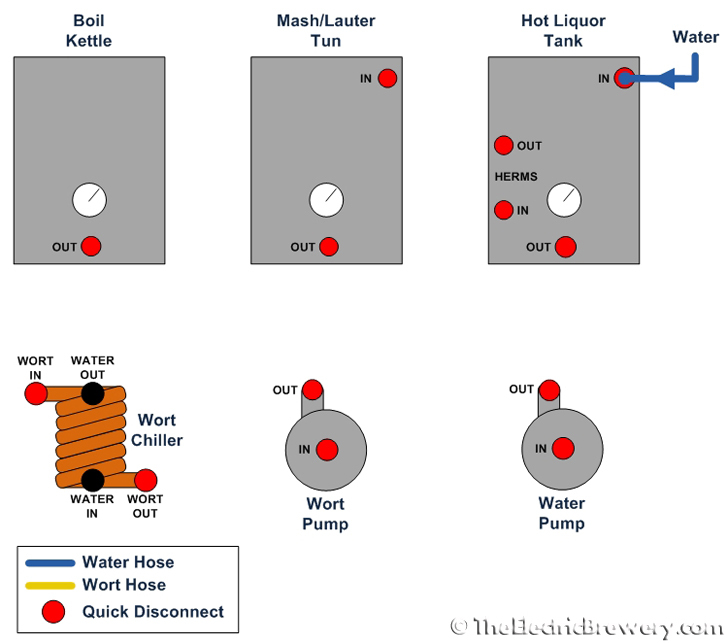 Use the water hose adapter (optional) to connect one of the hoses between the water supply and the Hot Liquor Tank IN valve as shown in the picture below. OPEN the Hot Liquor Tank IN valve and then turn ON the water source. Fill the Hot Liquor Tank to the 20 gallon mark. Turn OFF the water supply. CLOSE the Hot Liquor Tank IN ball valve. The Hot Liquor Tank is now full of cold water. Add one crushed 500mg campden tablet (potassium metabisulphite) to the 20 gallons of water to remove chlorine/chloramine. Most cities use one or the other to treat the water. The chemical reaction is instantaneous. There's no harm in adding one tablet even if you're unsure if your city uses chlorine/chloramine. If left in, chlorine or chloramine can give beer a band-aid or plastic taste. If your city water is soft (low in minerals/salts) and tastes fine then using cold tap water is perfectly adequate. 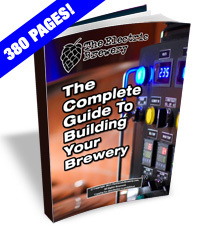 We'll use our city's water in this guide as it is very soft (low in minerals) which means it's great for brewing as you can always increase minerals by adding salts but cannot easily take them away (distillation or reverse osmosis must usually be performed). For complete details on what water to use, refer to our Water Adjustment guide.